SNAFU! 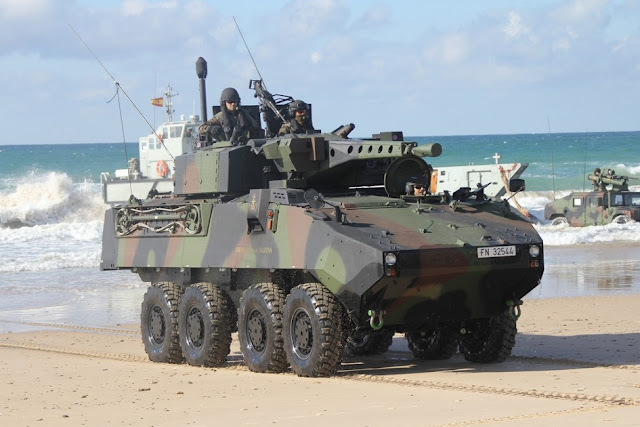 : Spanish Marines to receive upgraded Piranha 1 Infantry Fighting Vehicles. Spanish Marines to receive upgraded Piranha 1 Infantry Fighting Vehicles. General Dynamics European Land Systems (GDELS) is set to begin work on upgrading some of the first batch of Piranha 1 infantry fighting vehicles (IFVs) it supplied to the Infanteria de Marina (the Spanish Marines) in 2003-04. The 8x8 vehicles will go through a mid-life maintenance programme and update that will bring them into line with version 2 that was delivered in 2007-13, a company spokesman told Jane’s on 18 September. “The contract is signed and we expect to start work before the end of the year,” he said. It will cover an initial 18 vehicles and is worth EUR9.9 million (USD11.6 million), which will be spread over the length of a contract due to be completed by 2021. Wow. Don't quite get this one. They've already decided to buy Piranha V's so the decision to upgrade their older rides is beyond me. I imagine they're taking the same stance the USMC took initially with the ACV and AAV-SU, until the decision to focus on modernization of the entire fleet.